Vermont Independent Senator Bernie Sanders failed to condemn calls for harassment and violence against Republicans. Sanders appeared on CNN’s “State of the Union with Jake Tapper,” and was asked to comment on the uptick in violence and harassment and on the comments from Democrats supporting the dangerous antics. 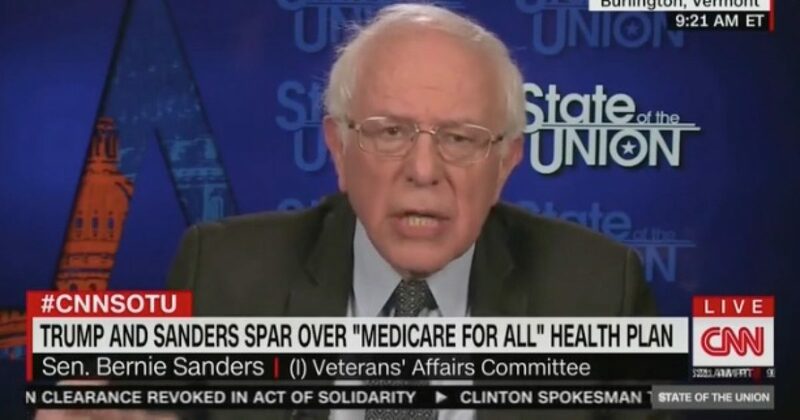 Sen. Bernie Sanders declined to condemn the harassment and violence against Republicans in an interview with CNN host Jake Tapper on Sunday — and instead called on Americans to “fight” for progressive causes. I don’t think it’s a question of high or going low. I think it’s a question of telling the truth. The truth is you have a president who lies all of the time, a pathological liar. I don’t think that’s what the American people want. I am very strongly in favor of mobilizing the American people to stand up and fight for economic justice, social justice, and racial and environmental justice. I think we have to mobilize people. I am not a great fan of being rude or disrupting activities, but, this is what I will say. This entire 2018 election is going to come down to two words and that is ‘voter turnout.’ If you are out there and you’re sick and tired of what’s going on with the very rich getting richer while the middle class continues to struggle, then you are not going to have to get out and vote, but you’re going to have to get your friends and your families to vote. Several prominent Democrats are backing in your face activism against Republicans. California Democrat Representative Maxine Waters sounded the alarm before a crowd of supporters and said ‘the people’ will ‘absolutely harass’ Trump staffers. Fox News reports (watch video). New Jersey Senator Corey Booker urged activists to “get up in the face” of congressmen. The Daily Wire reports (watch video). Former two-time presidential candidate Hillary Clinton backs Democrat incivility as a means to fight back against Republicans. Clinton appeared in an exclusive interview on CNN with host Christiane Amanpour. Liberal activists are stepping up their rebellion against Trump staffers and supporters. Breitbart publishes a running list of threats and violence against Trump supporters. Since Donald Trump announced his run for president in 2015, Breitbart News has documented nearly 600 known instances of left-wing violence, threats, and rationalization of political violence and threats. Democrat leaders are fostering a dangerous environment where in your face activism will lead to more people in harms way. Real Clear Politics posted the entire CNN interview.